HP USB Disk Storage Format Tool Portable can format any corrupted USB flash disk .It help to fix unfomatted USB pen drives even if write protected .Try the free software now . HP USB Disk Storage Format Tool 2.2.3 is a portable software designed to format USB flash disk and SD memory cards . It allow to format any USB pen drive in FAT, FAT32 and NTFS file systems .Another option of portable HP USB Disk Storage Format Tool is making bootable disks that can help boot a PC. 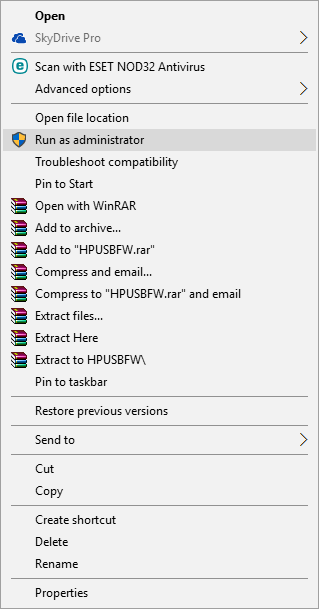 HP USB format tool can make a quick and save format to your damaged USB stick .It can erase all of your data space on your flash disk that can't be removed .HP USB Disk Storage Format Tool Portable v 2.2.3 can help you to fix the flash disk when device media is write protected .Also can remove any malicious programs in your infected USB flash drive . SDHC, SDXC Memory Stick Duo Pro, CF Card II and Compact Flash . How to use Portable HP USB Disk Storage Format Tool ? 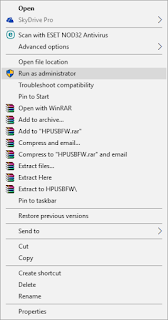 First download HP USB Disk Storage Format Tool Portable v2.2.3 from download links below. Insert your damaged USB flash disk to your computer . Run the tool as administrator by clicking right click on the software then choose Run As Administrator . Choose your flash disk from Device . 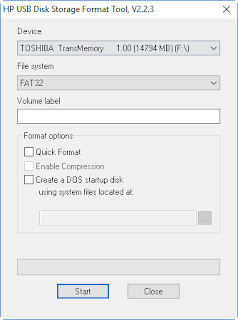 Choose the format type FAT32 or NTFS . Click on Quick Format . Click Format , A message will appear to you click Yes .